It’s hard to overlook HTC’s numerous problems and financial shortcomings of the past year. The Facebook Home-laden First didn’t sell; the company suffered a management exodus; and some people still can’t get over that inexplicable Robert Downey Jr. commercial. It really is a shame the company has fallen on hard times, because it’s capable of making truly great products. 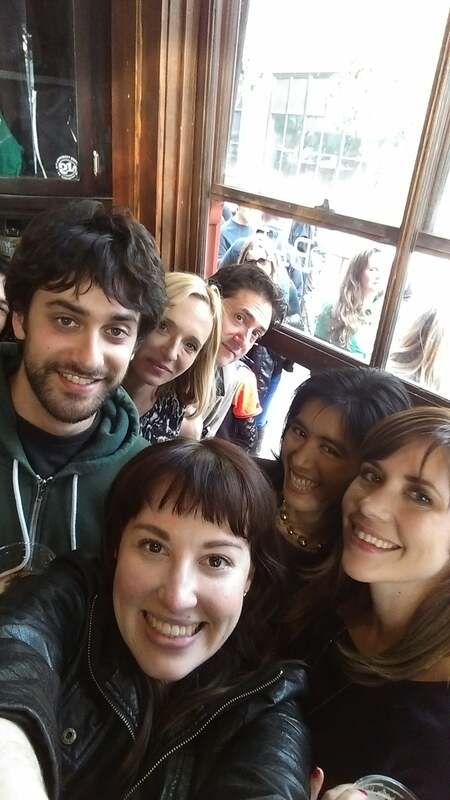 Case in point: the new HTC One (M8), which is now the best Android phone on the market. The One is HTC’s second attempt at a super-premium Android phone, and it’s even more impressive than its predecessor. It’s beautiful, battery-efficient, and fueled by all the latest components—and that UltraPixel camera still excels in areas where other camera phones have fallen short. We really, really like it. The HTC One (M8) looks good from afar. HTC has done it again: It’s managed to bring panache to an otherwise uninspired market of Android devices. 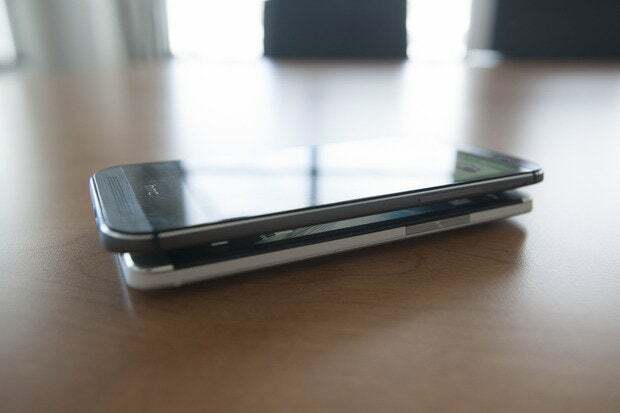 The company’s executives have taken numerous digs at its competitors’ plastic-y phones, and for good reason—they’re more prone to cracking while the HTC One is essentially a tank, due in part to the fact that 90 percent of its chassis is metal. While it’s certainly not impenetrable, it is one of the most polished Android devices out there. HTC chose a smooth aluminum finish that doesn’t feel scratchy to the touch, and it feels great in the hand. In the Android market, nobody has come close to HTC’s industrial design or build quality. The brushed metal on the One’s backside feels smooth to the touch. The power button on the second-generation HTC One has been moved from the top-left to the top-right, while the volume buttons remain on the right side. You’ll also notice there are pinholes on both the left and right sides of the device that pop out to reveal the nanoSIM and MicroSD card trays. As a result, the One is only available in 16GB and 32GB variants, since it now features expandable storage—a feature that consumers wanted in the original One, even though Android 4.4 KitKat isn’t exactly friendly to SD cards. In the U.S. market, most carriers are defaulting to the 32GB version, a nice bump from entry-level 16GB phones. 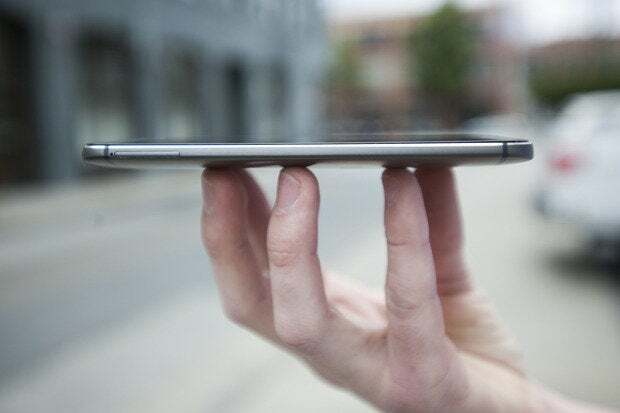 The HTC One (M8) is not as thin as its predecessor, but it sure is sturdy. HTC kept the charging port on the bottom, but placed the headphone jack next to it. This becomes a slight inconvenience if you’re watching a video or listening to music with headphones on while it’s charging. The One also supports QuickCharge 2.0, but curiously comes boxed with a QuickCharge 1.0 charger, so you’ll have to purchase a new charging mechanism to take advantage of that particular feature. The One is just a bit bigger, wider than last year’s One. The One (M8) is less than half an inch longer and about 5 mm thicker than its predecessor. Though I vehemently prefer smaller phones because of my relatively small hands, I didn’t find the size of the HTC One (M8) overpowering—especially not like its sibling, the One Max. However, I did suffer the occasional unintended palm tap when I was holding the device with two hands. It’s also one of the heaviest phones I’ve handled in a while, but that’s expected with its metal chassis. 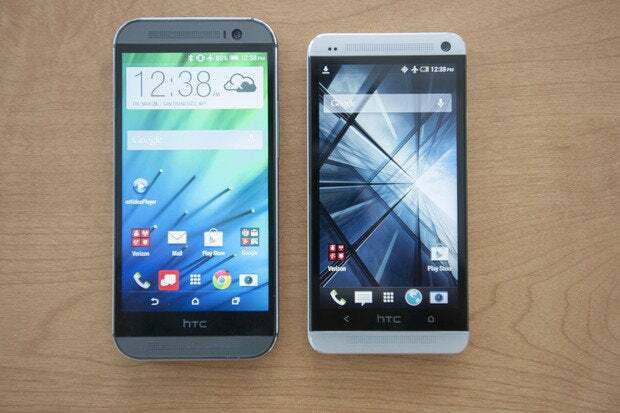 The HTC One M8, next to its predecessor, the HTC One M7. HTC got rid of the old two-hardware-button setup and opted for three software buttons instead. While it does steal a bit of screen space from the One’s 5-inch display, the new setup ensures that the device will always be up to date with Android’s button standards. Still, there’s an awful lot of unused bezel beneath the screen. The new One (M8) features three software buttons instead of two hardware ones. HTC beefed up almost everything about its new flagship handset, except for the screen. It’s essentially the same Super LCD 3 display panel, but .03 inches bigger (therefore providing fewer pixels-per-inch). Its viewing angles are perfectly acceptable for watching a YouTube flick with a friend because there’s no color or contrast deterioration, and at full brightness, you can see the screen outdoors just a bit more clearly than some Super AMOLED displays. The HTC One (left), as compared to the Samsung Galaxy Note 3 (middle) and the LG G2 (right). The HTC One’s color profile looks slightly washed-out when compared to other current Android devices. At full brightness, the One’s blacks aren’t nearly as black as on the Note 3’s Super AMOLED, but that’s to be expected with the LCD 3 displays. At least its colors aren’t as saturated as the Galaxy Note 3’s. 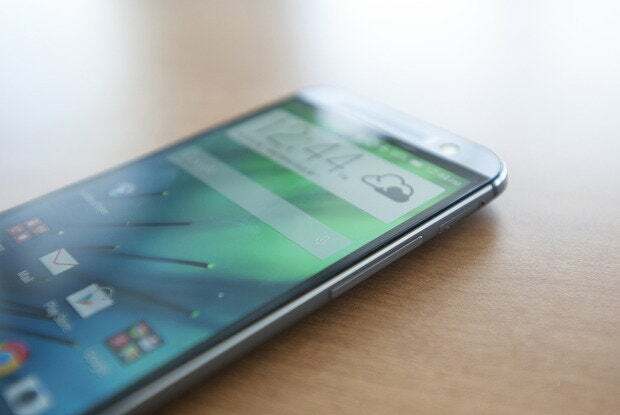 The HTC One is powered by a 2.3GHz quad-core Qualcomm Snapdragon 801 processor and 2GB of RAM. It’s the first phone in the US available with that particular system-on-chip (SoC) and though its no-lag, easy-to-multitask performance feels like a breath of fresh air, it’s the energy efficiency of the processor that’s especially alluring. HTC has repeatedly played up the fact that its integrated 2,600mAh battery pack is a power saver, and they weren’t kidding. It lasted through two days of varying usage without needing a charge, and it’s almost as if it goes dormant on standby. The HTC One also managed exactly 10 hours of constant video playback in airplane mode. That’s half an hour longer than LG’s G2, but an hour less than the Galaxy Note 3. Both of those devices are larger, and have 3,200 and 3,000 mAh battery packs, respectively. It’s impressive that HTC managed that much battery life out of a significantly smaller battery pack. You can also take advantage of the One’s Extreme Power Saving mode, which reverts the One to a simplified interface and disables background services once the phone’s battery level gets too low. U.S. carriers are still approving the software update that includes the Extreme Power Saving mode, so early adopters will have to be satisfied with a less aggressive, less “Extreme” regular Power Saving mode. The HTC One (M8) stands proudly in its Dot case. On Verizon, the HTC One had stellar call quality. It also comes standard with dual-band 802.11a/a/c/b/g/n Wi-Fi and Bluetooth 4.0, as well NFC, Tap & pay abilities, and a heaping of “Smart Sensors.” While sensors are typical to most smartphones—accelerometers, gyroscopes, proximity sensors, that sort of thing—HTC has incorporated low-power, always-on sensors and opened them up to developers through the Smart Sensor Hub. Currently, only a small number of apps utilize them—one is FitBit, which lets you track your steps with MobileTrack without having to purchase the wristband. Low-powered sensors do seem to be all the rage lately, but it’s too early to determine whether they’re a useful addition or a marketing gimmick on the One. We’ll explore these after more app developers come out in support of the Smart Sensor APIs. They’re not Beats Audio speakers, but they sound even better than before. Last year, the HTC One boasted its Beats Audio sounds, but since HTC sold back its rights to the franchise, the One now features HTC’s own BoomSound speakers. No matter: the sound quality is still impressive, whether you’re listening to music or perusing YouTube. HTC kept the speakers on the front so that you don’t have to lay the phone face down when you want to pump up the jams, and you won’t accidentally cover up a speaker when you’re holding it, either. The One also comes equipped with a better amp than its older sibling, and the bass becomes more noticeable the higher you turn up the volume. I was especially impressed at how loud the volume got when I hooked up a mini smartphone amplifier to it. The difference is discernible even while streaming low quality tunes through Spotify. 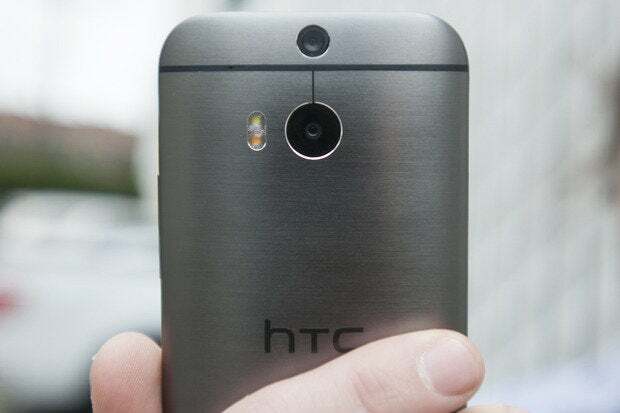 Just as speculated, the HTC One has not one, but two rear-facing cameras. But before you start thinking you’ve got yourself a deal, consider that the extra camera doesn’t actually do much to make your photos look better, pixel for pixel. It’s just there to help with the One’s fancy post-processing tricks, such as Ufocus, which lets you create depth-of-field effects for artsy blurred backgrounds. It’s a really cool trick, but doesn’t mitigate the fact that the new One’s rear camera just doesn’t yield best-of-class image quality. The HTC One’s depth camera effects are neat, but I don’t know that I would necessarily pin them as feature-worthy. 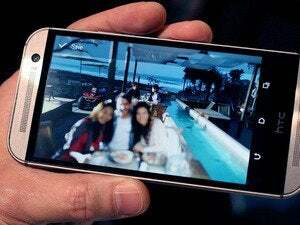 The HTC One’s main camera is a rear-facing, large format 4-megapixel sensor—the same “UltraPixel” sensor found in the original HTC One. It’s capable of 1080p video recording and shoots with a max aperture of f/2.0 at 28mm. The second camera is actually the same sensor used in the front-facing camera featured on the original One. At the grocery store with the HTC One. In the house with no overhead lighting, the One produced noisy photos with slight light leaks. The HTC One performed better than its predecessor in our low-light lab test. The photos were brighter and less noisy, but they still required some adjustments before they were ready for publishing. The One also features two rear-facing, dual-color LED bulbs, which aided in producing better color-balanced photos taken with the flash, rather than blowing out the subjects as some other smartphones do. There’s also a Night Mode you can use to avoid using the flash in low-light settings, like when you’re at the bar with friends. With the high studio lights on, the HTC One M8’s (right) colors were less grainy, blown out. It also fared better than its predecessor (left) in our low-light tests. Photos taken in ample lighting with the first- and second-generation HTC One were mostly indistinguishable, but while the photo looks great from afar, that 4MP UltraPixel sensor still has its drawbacks. These aren’t high resolution photos that you can zoom in on and crop. They’re great for posting photos to Facebook and Instagram, and while the One takes much better-looking photos than a lot of Android devices, its limited resolution is a drawback at times. Sleepy kitty is the best kitty. But zoom in, and you’ll start to see the UltraPixel camera’s limitations. Selfie mode offers a three-second countdown, so you can adequately prepare yourself for your brief moment of narcissism. 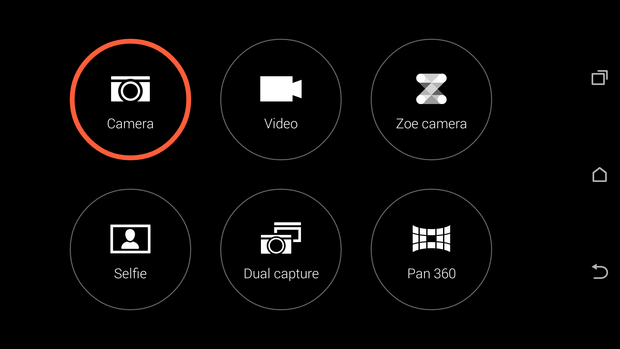 HTC also brought back the Zoe camera and added the ability to record an indefinite amount of video. There are tooltips to help you learn how to use the feature, and you’ll find Zoe especially helpful when it comes to making short Vine- or Instagram-worthy videos. Now you won’t have to launch a separate app to capture the moment. HTC successfully managed to cram a plethora of useful features into the camera application without making it overwhelming for the user. The main menu offers six options for taking photos, while the Settings button lets you easily set the camera mode, exposure, ISO, and white balance. There are also additional settings for cropping and setting the video quality, and you can save your own custom camera modes for use in the future. There are tons of modes for every situation, from a very fast burst shot mode, multi-exposure action shots, slow-mo video, and 360-degree panoramas. The HTC One’s six main camera modes. You can think of Sense 6 as a highly stylized version of stock Android. It’s not gaudy like Samsung and LG’s own Android overlays, and it brings a bit of finesse to the vanilla Android interface. HTC has kept the most essential parts of Android on par with Google’s rendition, so as to avoid scaring off die-hard Android fans. HTC’s interface blends in more with the general Google design aesthetic, so there’s less of a jarring transition between HTC’s apps and, say, Google Now. Not to mention that you also have access to Android 4.4’s new features, like the Location panel and wireless printing. Sense 6’s application drawer (left) only becomes bearable after you change its settings, while the Quick Settings in the notification panel (right) appears awfully crowded. I’m still not a fan of Sense’s application drawer, however. HTC incorporated an extra column of icons, but by default the apps are too spaced-out, using up precious screen space. I’m also not particular to the Quick Settings in the Notifications shade; the icons for each option are too big, and at first glance it looks messy and crowded. But you can rearrange the icons and eliminate the settings you don’t plan to use. 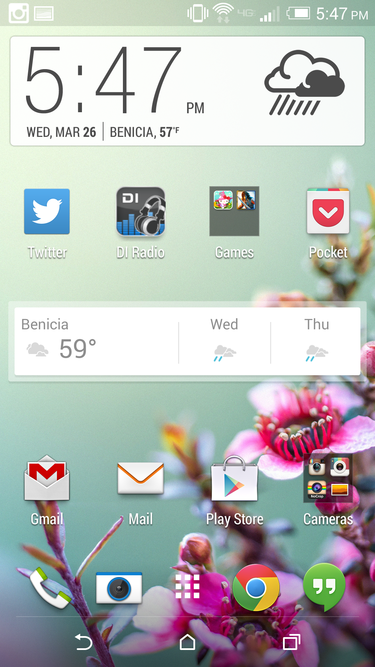 Sense 6 is a bit more colorful, too, with the addition of themes. Though you can only choose from four different ones at the moment, HTC hinted that it’s considering opening up theming capabilities to its loyal Android base. For now, all you can really customize is the wallpaper, font size, and font style. HTC brought colors and Themes to Sense 6, though you’ll only see the color pop through in certain apps.